George Edward Hart: Social worker. Poet. Romantic. Father. Born Oct. 15, 1914, in Charlottetown; died Nov. 19, 2018, in Toronto, of natural causes; aged 104. Visiting George, my next-door neighbour, was my nightly ritual. It was my treat. He liked to say that making it to 104 would be enough. He made it, and went just as he wanted – in his comfortable corner apartment, tended by his caregivers and with two of his six children close at hand. In his last seven years, George began a magnificent final act of creativity. Assisted by his son Jonathan, he published seven books of poetry. Initially the verse was a cry of loneliness. In 2005, his wife, Jean, who he had met when they played opposite each other long ago in a one-act play at Acadia University, collapsed and died of a stroke while out walking. George wrote: My love went a-walking She did not know to say goodbye She did not know to say goodbye And came not home again. Years of sadness followed. Until Mary MacMillan came into his life. And then he wrote: By chance I went calling on a lady And forgot my dark pain, Quick from my lips words sprang, ‘Oh Mary, you look so young!’ Mary, in her 90s, also writes poetry, and together they were regulars at Tafelmusik concerts. Sometimes on my evening visits I would find them eating the little sandwiches Mary had brought. Or else they would be sitting with their arms around each other, reciting poetry. Our Toronto seniors building – SAHIL (Stay at Home in Leaside) – was a blessing. George called it “this laughing, twingeful, helping place,” in a poem. Our board chair, Edna Beange (who died just after George at the age of 98), always said our weekly tea times took on extra life when George came. 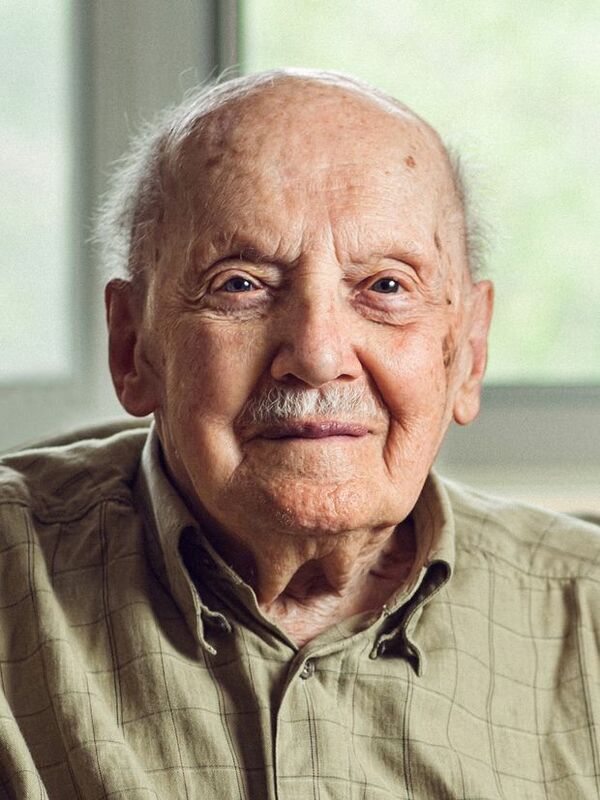 In Prince Edward Island, George taught at a rural school and worked as a radio announcer for CFCY, then served as an education officer in the Royal Canadian Navy during the Second World War before finding his true calling: social work. The issues stayed with him. Even in the last few days of his life, he still regretted not speaking out more strongly against the scourge of poverty as head of the Social Planning Council of Metropolitan Toronto. At SAHIL, his caregivers were like granddaughters: He urged one to resist pressure from her family to return to an arranged marriage in India. She went anyway, but kept in touch. George was also excited and thrilled to discover one of his helpers had finally, with his encouragement, got her RN qualification. At his memorial, George’s daughter Jennifer spoke of how he urged her and her sisters, Gwendolyn and Deborah, to be their own person and never be dependent on men. It is fashionable to say that at 104, a person has lived too long. I only wish George had lived longer, long enough to see the Trumps and the Fords and the newly resurgent populists he abhorred bundled into the bin of history. I can still hear George saying, “So kind!" in return for the smallest favour. A saint? Not quite. You should have heard him object when, at 102, he stood to lose his choice parking spot in the garage. And no, he was no longer driving. Frank Jones is George’s neighbour.